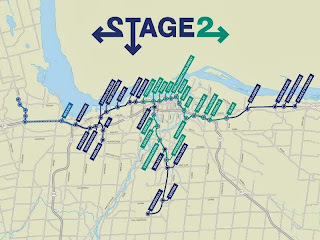 "Hoping to position himself as a transportation visionary before next year’s civic election, Mayor Jim Watson announced major changes to the city’s master plan for transit, roads and cycling Wednesday morning that would extend rail west, south and east by 2023. "It would also handcuff the city’s transit spending for 25 years after that, and it relies on charging buyers of new homes and offices a lot more in development levies than they’re used to paying." "A $3-billion expansion of Ottawa's rail system can happen in 10 years with the help of upper-tier governments, a 2.5% annual property tax increase and inflationary increases to transit fares, Mayor Jim Watson said Wednesday." "Light rail emerged Wednesday as the showpiece of the city’s new Transportation Master Plan, with an ambitious $2.48-billion proposal to add 35 km of rail and 19 new stations." 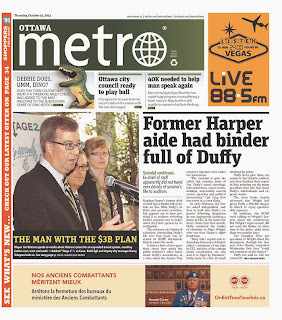 Matthew Pearson, Ottawa Citizen: Collected initial reactions from local federal and provincial politicians, including John Baird, David McGuinty, Lisa MacLeod, Glen Murray, and Yasir Naqvi. "In an unusually pre-hyped speech Wednesday morning, Watson not only laid out his vision for transit expansion in the capital but signalled what will undoubtedly be one of his major re-election platform planks: expanded rail. "Watson’s plan is a brilliant tactical move, not only because it’s actually a great idea to fast-track rail — finally! — but there’s almost no political downside." "Under Watson's plan, the cost of the light-rail portion of the plan is roughly $3 billion, requiring about $1 billion each from the city, the province and the feds. "That is problematic on many levels. "How likely is it either the province or the feds are going to belly up to the bar — all in?" "Mayor Jim made a big deal of his success on the Confederation Line project by having a budget first, then build to the budget (rather than design the best line, and figure out how to pay for it). He praised his initiative in bringing in this new budgeting system, and announced other cities are copying it. (Having just read Margaret Thatcher’s biography, I recall that she fought the same battle in the 1980′s in Britain and was roundly vilified for it. Maybe Jim will do better; it is, after all, 30 years later.)"